Recognizing that safe and adequate water supplies are an essential component of fighting poverty and disease, the Asian Development Bank Water for All Publication series focuses on understanding the water issues facing poor people in the developing nations of Asia and the Pacific. This study looks at small-scale, private water providers in Asian cities and the entrepreneurial potential of small piped network operators. 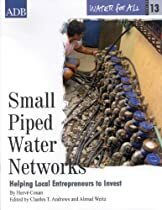 It proposes that city officials, city water utilities, and local banks work closely with small network entrepreneurs to bring water suppliers to the poor and disadvantaged.